This sweater started as an over-sized, out-dated cropped top that I had laying around the closet. I almost tossed it in the trash, but got to thinking that it wouldn’t hurt to play around with it a bit and see if it couldn’t be updated. 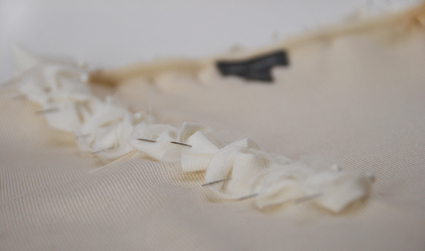 The true inspiration for this project comes from a true pioneer in refashioning clothes, MadeByLex. She is a genius at working with materials to create new and oh-so-stylish creations. 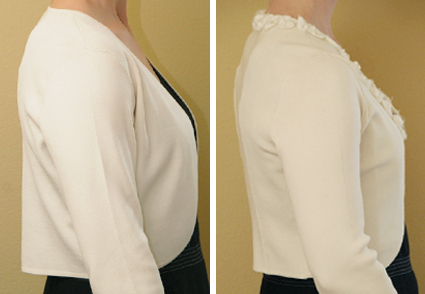 Here is a before and after shot of the sweater. 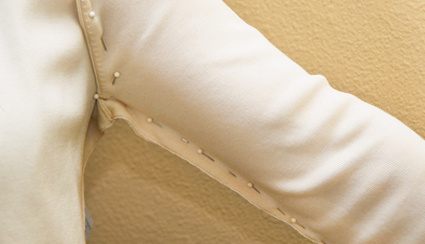 The alterations may be subtle, but they make all the difference. The original sweater fit poorly, was loose in the back and sleeves, and looked like something my grandmother would wear. The new version has some extra flare around the collar with a J-Crew inspired fabric design. The first steps involved tailoring the sweater for a bitter fit. 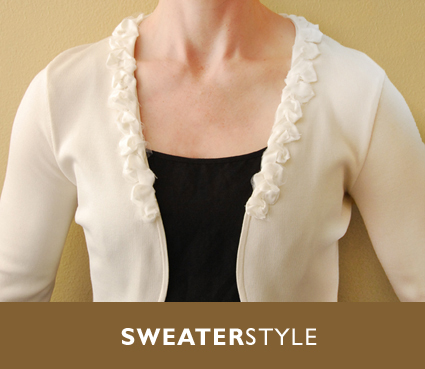 For lack of a sewing form, I wore the sweater inside-out and pinned along the seams until the fit was just right. To fix the back, the sweater also needed a few darts. I pinned these at the table, then tried the sweater on to see how it fit. It took a couple of rounds to get it just right. 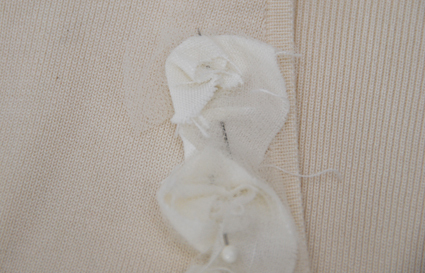 The collar for the sweater is made of nothing more than a few strips of tulle and cream-colored linen. To make the collar, I coiled the fabric strips around and around to make a series of ruffled loops and then pinned them down. Here is the sweater collar all ready to go. The next step was to tack down each coil with 3-4 hand stitches with needle and thread. 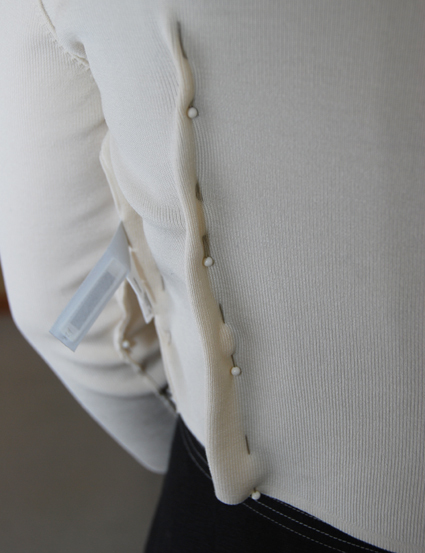 I found this was much less conspicuous than using a sewing machine, and it allowed for the sweater to move and stretch without breaking any stitches. Here is what the finished sweater looks like from the back. I am so happy with the result. I may never throw away an old piece of clothing again! 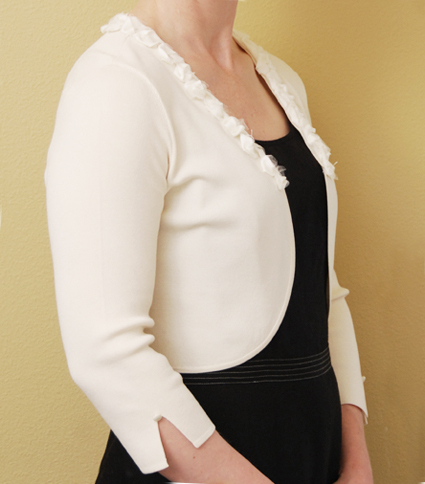 This is really beautiful–I love the detail around the collar. Thank you! I hope to try a few more projects like this one over the summer. Thank you for a great post with nice close-up photos. I have been refashioning sweaters into plush critters. I have just started to toy with the idea of altering a sweater for my own use.